'TheDarkOverlord' is demanding a ransom to not leak unreleased content from Netflix, Fox and others. The next season of Orange is the New Black isn't supposed to premiere until June 9th, but the first episode has already leaked. That's because a hacker or group of hackers going by the name 'TheDarkOverlord stole the content from a third party, and they're demanding Netflix pay a ransom in order to keep the rest of the season private. Late Friday night, TheDarkOverlord tweeted about content belonging to ABC, FOX, IFC and National Geographic, saying "We're not playing any games anymore." According to TorrentFreak, the source of the breach was Larson Studios, an audio production company in Hollywood that does ADR (Automatic Dialog Replacement) work. The hackers claim Larson agreed to pay up but didn't, and now they're trying to squeeze Netflix. In a statement, Netflix has said "We are aware of the situation. A production vendor used by several major TV studios had its security compromised and the appropriate law enforcement authorities are involved." 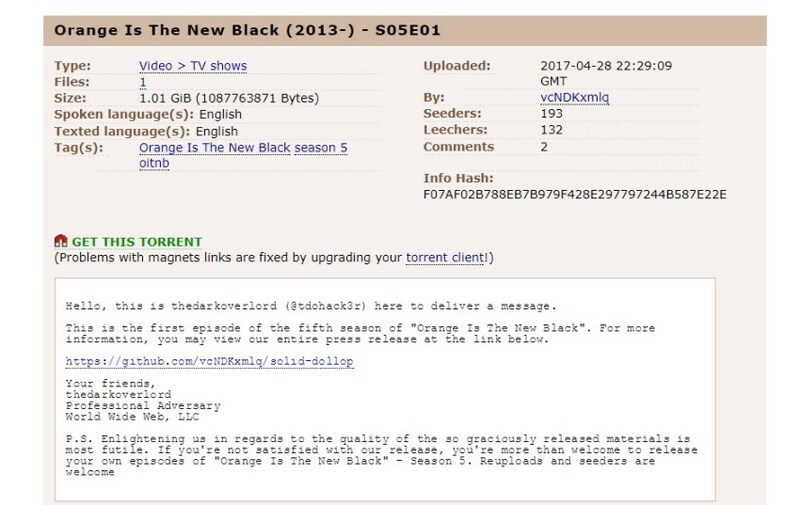 Update: "TheDarkOverlord" announced that they have released episodes 2-10 of the 13 episode season in another torrent. They also continued to threaten Netflix and the other studios, saying "You're going to lose a lot more money in all of this than what our modest offer was. We're quite ashamed to breathe the same air as you. We figured a pragmatic business such as yourselves would see and understand the benefits of cooperating with a reasonable and merciful entity like ourselves. And to the others: there's still time to save yourselves. Our offer(s) are still on the table - for now."